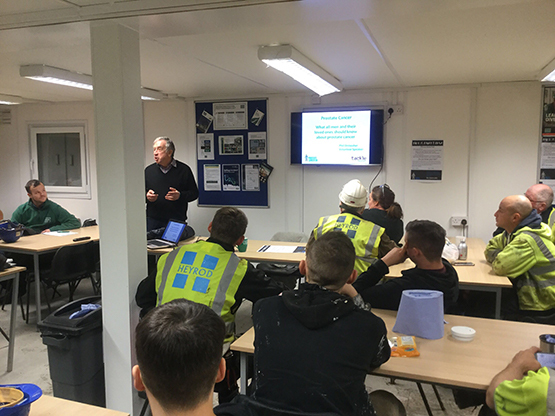 GRAHAM Construction are strongly committed to the Health and Well-being of their staff and workforce, and have established strong links with Men United, the Prostate Cancer UK Campaign. The Men United campaign is aimed at ensuring that prostate cancer is not ignored and encourages more men and women to join the fight against the silent killer that will be the most common cancer in the UK by 2030. GRAHAM’s Weavers Quay project for client Manchester Life has led the way for International Men’s Day and for the month of November by inviting Phil Ormesher, previously diagnosed with prostate cancer, of Men United to talk to the entire workforce. Movember is when brave and selfless men around the world grow a moustache, and women step up to support them, all to raise awareness and funds for men’s health – specifically prostate and testicular cancer. Phil Ormesher visited the Weavers Quay project, Manchester, and talked to staff about his own experiences to raise their awareness of this most common cancer among men. The talk was attended by 45 men and women of the fifty-strong workforce and provided an important insight into the illness, its risks, the symptoms and where further information or advice can be sought. The presentation was a huge success, with the five who missed out (due to a scheduled concrete pour) keen to attend a further talk being held after GRAHAM paid the support forward for all the other contractors engaged in the Manchester Life Framework.